Pumps are designed to move material from point A to point B, from low pressure to high pressure or recirculation. That might include something as simple as moving water, or it could be a more difficult application such as pumping adhesives or gels. There are thousands of pump designs and tens of thousands of applications for them. In a broad grouping, these pumps are broken down into positive displacement (PD) and centrifugal pumps. Centrifugal pumps make up the majority of the pumps manufactured every year and are an integral part of daily life. 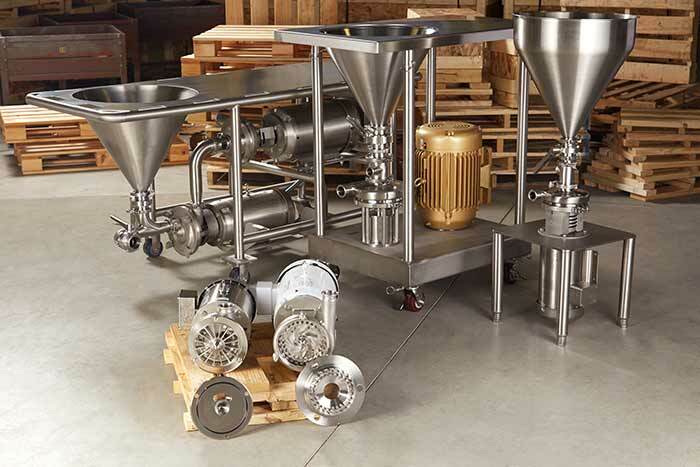 This article will focus on mixers and blenders that most often work in conjunction with process pumps and some cost-saving design ideas, mainly honing in on some centrifugal shear devices used in food and beverage processing and related industries. The first to discuss is a shear pump or shear blender and the second is an inline high shear mixer. These devices have been around for more than 50 years, built by numerous manufacturers, but have become more prevalent in the last 20 years as process manufacturers needed to reduce batch times and improve quality. Mixers and blenders can be inefficient centrifugal pumps at their core. They use rotating impellers to pump material through some type of orifice, slot or screen, thus creating hydraulic and mechanical shear. They are not as efficient at pumping compared to a dedicated centrifugal pump, but they use the horsepower to dissolve, hydrate, disperse, emulsify and mill products. The object is to blend first and pump second. This blended product is then used to create a variety of food, beverage, personal care, cosmetic, pharmaceutical and chemical products. Since a mixer or blender works like a centrifugal pump, it can self-pump up to +/-2,500 centipoise (cps). For many applications, these units then become dual purpose. For simple pumping applications, a mixer or blender is typically not going to replace a centrifugal pump, as they are much more complex and thus more expensive. Many customers use a centrifugal pump to recirculate a tank inefficiently to get rid of lumps or merely mix—sometimes overnight. When a customer needs to mix or blend and pump, shear mixers become an excellent choice because they pump and reduce mixing times. Shear mixers and blenders are not limited to 2,500 cps, but will require the assistance of a PD pump stuffing or pulling through them to process materials up to as high as 1 million cps. Whether low or high viscosity, it is common to reduce batch times by 40 to 70 percent in some applications. 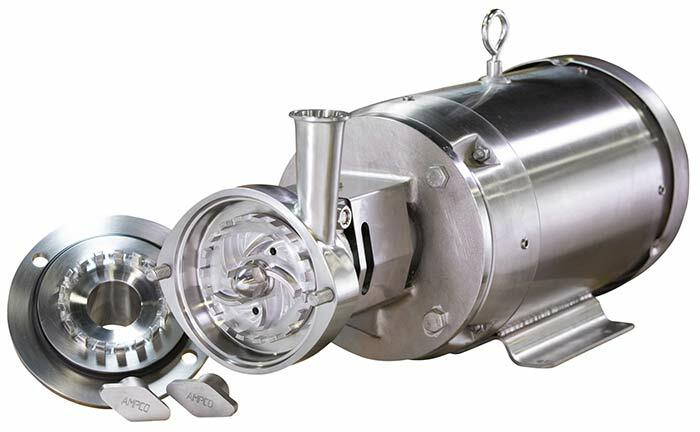 Some pumps can often perform mixer and blender dual duties. These units are not only used for recirculating batches, but with the correct piping they can also be used for powder induction or catalyst reactions. Some powder inducers offer enough vacuum to pull powders in with a single mixer/blender. These units mix, hydrate and homogenize the liquid and powder together and have the ability to recirculate the tank or pump it downstream. There are applications where it is useful to pass a product through the mixer or blender as a single-pass application during transfer to another part of the process or to the filling line. This is the case when too much shear would degrade the product (recirculation) but large solids or unmixed product is not desirable. If it is a low-viscosity application with low-head requirements, the mixer or blender can be used by itself. It will ensure no large particles or unmixed products are transferred downstream or into a packaged product. Blenders can also be customized by removing specific teeth or slots so that a customer can achieve a semi-smooth or chunky product instead of ultra-smooth product; many consumers want to see fruit or vegetable pieces. Recently a New England food manufacturer started processing a new, low-fat gravy for a dinner entrée. They were using a centrifugal pump to recirculate a 200-gallon cook tank while dumping starch and flavorings into the top. It took more than an hour to remove the starch clumps from the gravy so it could be portioned onto the entrée. The manufacturer did not want to make major changes to piping or electrical, as they use the current process system for additional products. Instead of continuing using the pump for this process, a 7.5-horsepower (hp) blender was used so the gravy would be lump free within 15 minutes. The blender met the required batch time and provided smooth and creamy gravy. The product received one final mixing pass as the blender pumped it to the portioner hopper then directly onto the entree. When next looking at a pump application or considering replacing a pump, ask, “is it truly just a pump,” or could it be a mixer or blender performing dual duties? Michael Boyd is a business development manager for Ampco Pumps Company. He earned a degree in mechanical engineering technology from Alfred State College and has more than 25 years of experience in rotating equipment, including compressors, pumps and mixers. He may be reached at 414.643.1852 or mboyd@ampcopumps.com. For more information, visit www.ampcopumps.com.